Collection The CFA Foundation, Inc.
Brief History Drawing of white Persian born in 1908, by well-known artist Mrs. H. V. Furness, dated between 1909 and 1912. Acquisition Purchased by The CFA Foundation, Inc, December 2015. Photos: Courtesy of The CFA Foundation, Inc. The mission statement of The CFA Foundation includes the "acquisition of artwork". To this end, we were delighted to acquire a drawing of an early Persian, particularly when the cat could be identified and the painting dated as being over a century old. 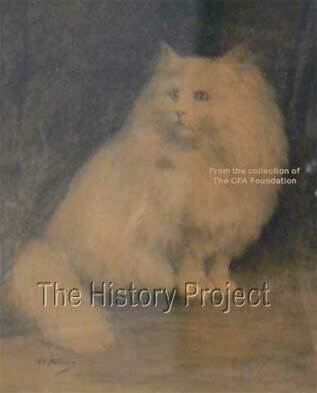 The drawing itself, of a white Persian, is done in charcoal. We were fortunate that a picture of the drawing was found in the May 1914 issue of The Cat Review, a popular publication of the era, printed in Elizabeth, NJ and dedicated to the subject of cats. We were doubly fortunate that both the cat and the owner were identified! 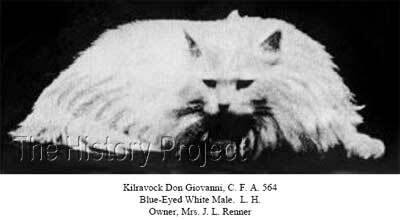 Image courtesy of The CFA Foundation, Inc.
"Don Giovanni', also known as 'Kilravock Don Giovanni', was a blue-eyed white Persian male, born July 9, 1908. He was registered with the American Cat Association (ACA 1352, v5) and with the Cat Fanciers' Association (CFA 564, v2). He was bred by Miss J. Kroeh of Orange, NJ, and his owner was Mrs. J.L. Renner of Medford, OR (and later Richmond, CA). The pedigree for Don Giovanni is shown below. 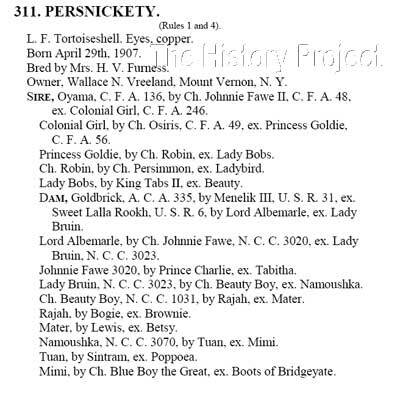 In additional generations, this pedigree traces directly to cats imported from Persia and also to the famous white Persian stud, White Friar, in England. 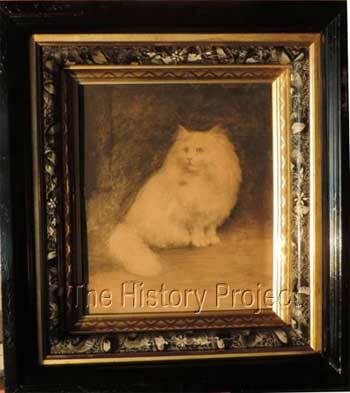 As the cat was born in 1908 and appears to be an adult in the drawing, we feel confident that the date of the drawing is between 1909, and 1914 when the picture of it was printed. Handwritten on the back of the drawing is "Best in Show 1912", which may further narrow the date as between 1909 and 1912. 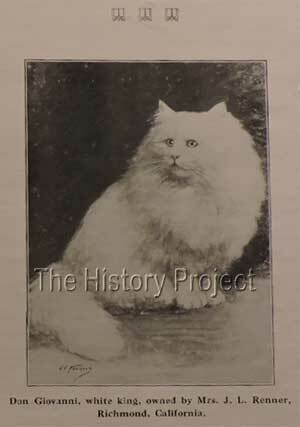 In Volume 2 of the Stud-book & Register of The Cat Fanciers' Association wins for Kilravock Don Giovanni are listed as "1st, Novice, 1st, Open, Portland, 1912", which would confirm the win noted on the back of the drawing. 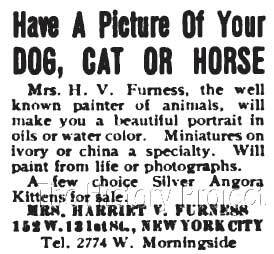 Mrs. Harriet V. Furness was a well-known animal painter who lived in New York City and advertised her services in various magazines. In addition, she was also a breeder of Angoras (Persians) in a variety of colors, and numerous of her cats (with exceptional pedigrees) can be found registered in the early studbooks of The Cat Fanciers' Association.